It’s time to RSVP to attend the MPA Commencement Ceremony & Reception. This is the MPA-specific ceremony for MPAs graduating in fall 2018, spring 2019, and summer 2019. Graduates and their families/friends are invited to attend a reception prior to the ceremony (light refreshments will be provided). The deadline to RSVP is Wednesday, May 1. An RSVP is required from each and every graduating student. There is an option to select “Not Attending Commencement” if you will not be attending. If your RSVP information changes any time before May 1, you can just go back into the RSVP link and edit your RSVP. There is no need to contact the MPA Office. An RSVP for the ceremony is not the same as a degree application. If you are officially receiving your MPA degree this spring, please refer to the emails from your academic advisors with application instructions. If you are receiving your MPA degree this summer, you will RSVP for the ceremony now, and wait to apply for the degree in the summer. If you are graduating with your BBA degree this semester, there is a separate BBA Commencement Ceremony. More information, including how to RSVP, can be found here. The University-wide ceremony will be the evening of Saturday, May 25 at the Tower. For more information, please see the University Commencement website. 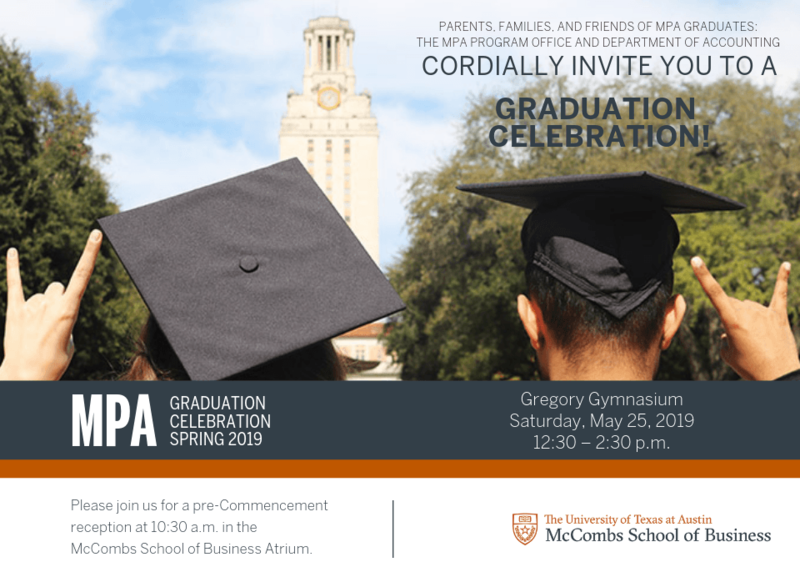 Please contact MPAEvents@mccombs.utexas.edu with any questions.